Treatment Rooms and Hallway with natural elements and artwork throughout the clinic. Reception Room- There are 2 separate play areas for kids with books, blocks, toys, and coloring books. 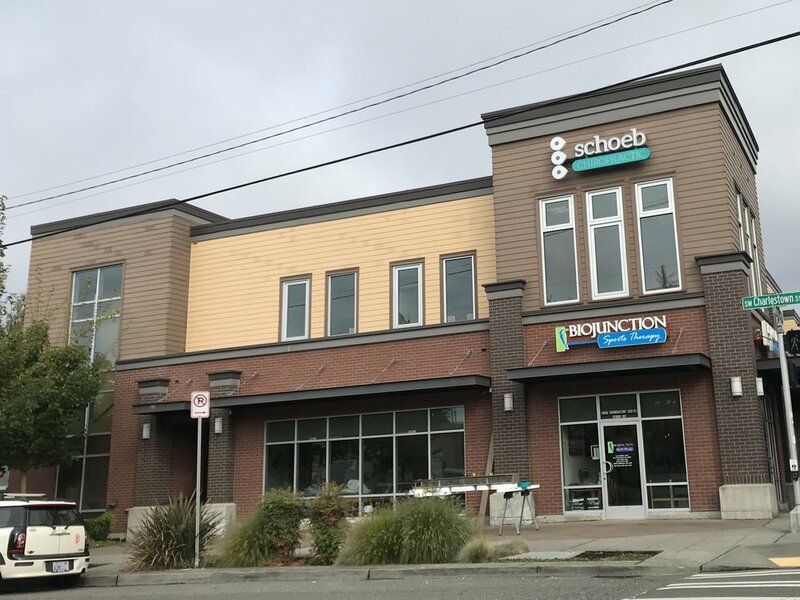 Next door neighbor to Meeples Games in West Seattle on the corner of California Ave and Charleston Ave.
Schoeb Chiropractic is on the 2nd floor above Biojunction Physical Therapy. Parking and elevator are to the left, behind the building in this picture. Chiropractic Hylo table- you can stand on the table and have the table help you up and down! Middle section supports even up to a full term pregnant patient laying face down. Chiropractic low back traction table for stretching the lumbar spine and lower back discs. Middle section lowers down but still supports up to full term pregnant patient laying face down! Signage from the off street parking behind the building. 2 stairways and an elevator help you up to the 2nd floor clinic entrance.